This book has recently been updated and the fourth edition is now available. 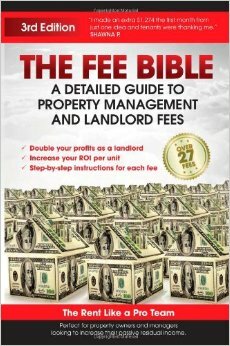 However, we still have a few copies of the third edition which highlights over two dozen Fees landlords can utilize. The remaining issues of the third edition are being made available at a special Half price offer while they last. Only $12.50! Only $12.50 - half price with free shipping - for the third edition of this book while they last! Click the link below to order now.